Wheelchair Basketball Canada extends its condolences to the family and friends of Ken Hall who passed away January 23 in Vancouver. 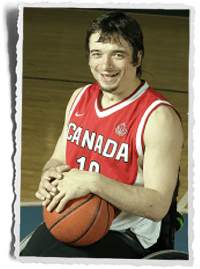 “Kenny” as he was known, was a former member of the Canadian men’s wheelchair basketball team. He represented Team Canada at the Paralympic Games in 1996 and 2000, when the Canadian men won the first Paralympic gold medal in team history. Hall was also a three-time bronze medallist with Team Canada at the world championships in 1994, 1998 and 2002. A celebration of life will be held in Vancouver on February 9.